The breadth of fresh, in-season ingredients available to Canadians is one of the many gifts of our country’s cuisine. To help Canadians celebrate Canada 150, Chef Lynn Crawford – Chef/owner of Ruby Watchco and Loblaw culinary partner – has crafted a delicious selection of recipes that incorporate fresh, seasonal Canadian staples and exciting global flavours to create Canadian-international fusion, a trend identified in Loblaw’s 2017 Canadian Food Trends. 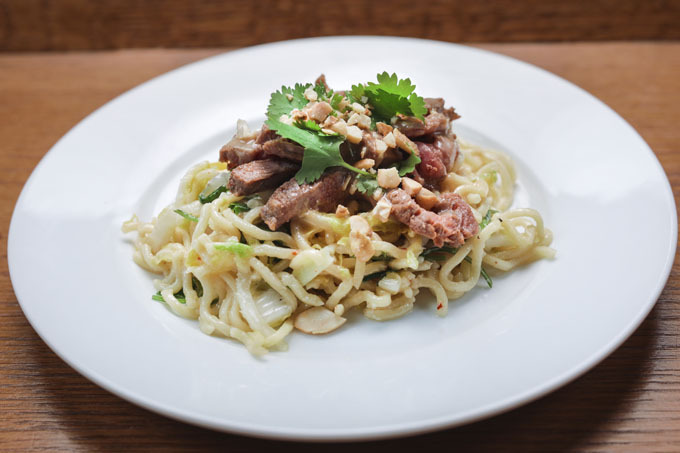 With inspiration from both classic Canadian favourites and exciting international cuisine, Canadians need look no further for their summer menu. In a blender, add the soy sauce, cilantro, garlic, sambal, lime juice and ginger; blend until smooth. Place the chicken in a shallow dish and top with the soy sauce mixture. Refrigerate and let marinate at least 1 hour or overnight. In a medium shallow bowl, mix together the flour, pepper and salt. Place the buttermilk in another shallow bowl; set aside. Pour oil into a large heavy skillet to a depth of 3/4-inch (2cm). Prop deep-fry thermometer in oil so bulb is submerged. Heat over medium heat until thermometer registers 350F (180C). Meanwhile, in a medium bowl stir together the cabbage, kimchi, carrots, mayonnaise and vinegar until well coated; set aside. In a small bowl, mix together the mayonnaise, garlic and Gochujang; set aside. Working with 1 piece of chicken at a time, remove it from the marinade and let the excess marinade trip off. Discard marinade. Dredge the chicken in the flour mixture, shaking off the excess. Dip in egg allowing excess to drip back into bowl. Dredge cornflake mixture, shaking off excess. Fry chicken until golden brown and cooked through, 3 to 5 minutes per side. Transfer to a wire rack set inside a baking sheet. 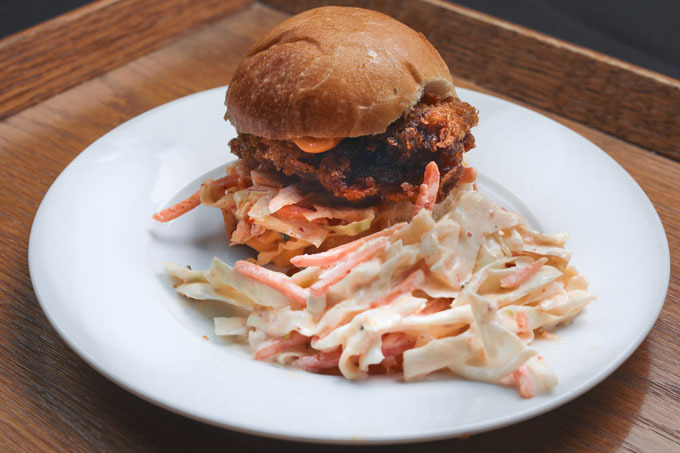 Serve the chicken on the buns with Gochujang aioli and kimchi slaw. In a large sauté pan over medium high heat add some olive oil and the chicken. Season with salt and pepper. Cook for about 3-4 minutes until just cooked. Return the pan to the stove and add the sweet potatoes and onion and cook until just soft. Add the eggplant and pepper and continue cooking for 2 minutes. Add the garlic, ginger, chili, curry powder, turmeric and stir together well. Return the chicken to the pan and tomatoes and season with salt and pepper. Remove from heat and mix in chopped cilantro. Mix all of ingredients for the minted cucumber yogurt together and season well. 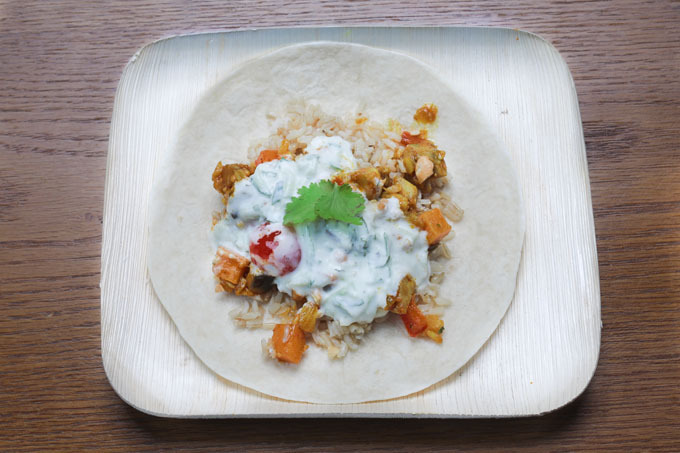 Spoon chicken mixture into tortillas and top with minted cucumber yogurt. Meanwhile, juice the lemons to get 1 cup (250mL) of lemon juice.